To say I'm nesting would be an understatement. 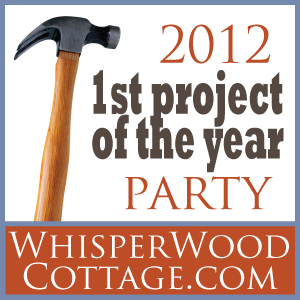 In fact, I'm starting to freak out a little bit about not having the nursery done. What if this little one comes early? AHH - I can't even think about it. 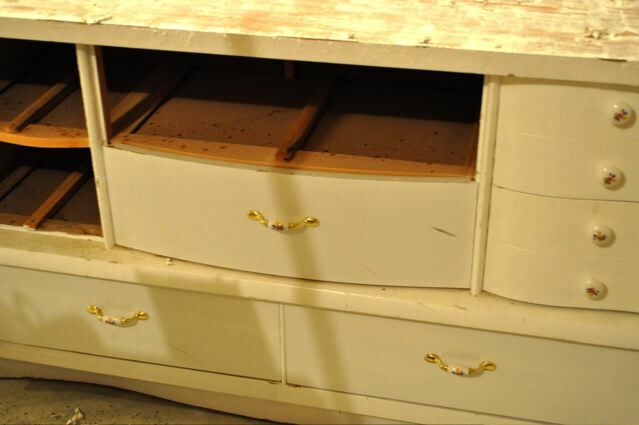 The dresser itself is Basset - and it had been well loved (with lots of layers of white paint) for years before it ended up here. I really liked the French Linen color, so I found a paint color that was similar at The Home Depot - Behr Olivewood. I had thought about staining the top in a walnut color to match the crib, but in the end, we ended up just painting the whole thing. For the knobs, I wasn't sure what I wanted - so I headed over to Hobby Lobby to check out what they had. As I was standing in the knob isle, I wondered why there were so many people crowded into that space. Then I realized that all of their knobs and pulls were 50% off. SCORE! 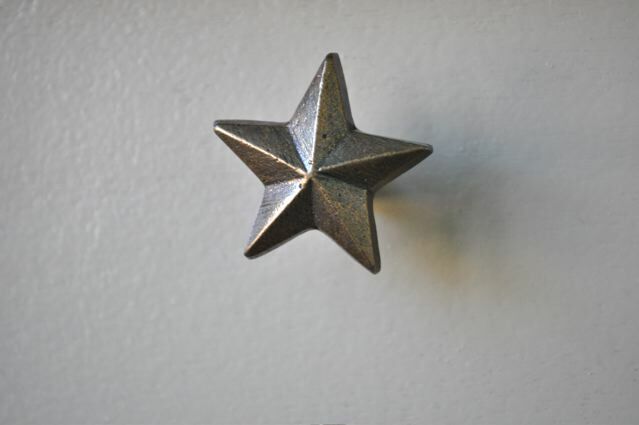 I picked up, and put down, a few different choices, until I found these stars. They were perfect! In the basket they went, at only $1.50 apiece! They didn't have any pulls that fit, so luckily Home Depot was just across the street. I ran over there and found these. Simple, but the color matched and the price was right. Once again - in the basket they went. I am so thrilled with the final product. It looks perfect in the room against the light aqua paint. Exactly what I wanted. Once more project down!! This weekend we tackle the electrical spool table. That should be interesting. I already have hubby strategizing to figure out how it will work. The crib will be delivered on Thursday - moving right along!! Starting to feel a little better, but I won't rest until it's all done! Posted by Jennifer at 7:26 AM 6 I would love to hear from you! Well - I'm 31 weeks now. Only 8 more weeks to go until we meet the little munchkin that has been bouncing around in my belly! 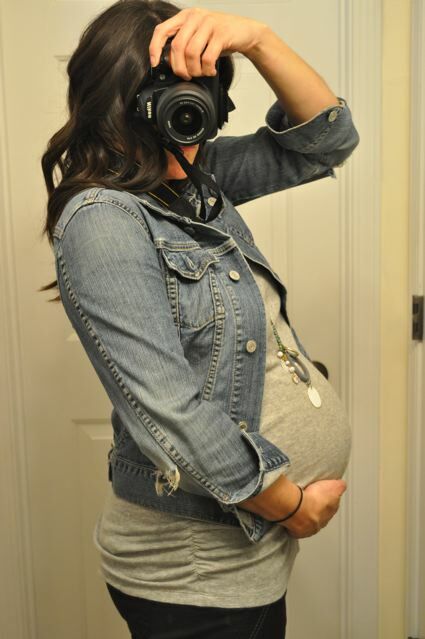 I'm definitely feeling the third trimester now - it's starting to get hard to move around. The swelling has begun - although so far not as bad as in my first pregnancy. With Addie, she was pressing on my main artery, and I had pretty severe edema - so swollen that I was unrecognizable. Of course, the 70 lbs I gained with her didn't help either. I ended up on bedrest for the last 6 weeks, and I'm happy to say (knock on wood) that this time around - I'm not experiencing a lot of those symptoms. My blood pressure has been pretty under control, and I have been managing to keep the weight gain down as much as I can. Don't get me wrong - as of my last dr. appointment - I have already gained 29 lbs - but compared to last time - I feel like a skinny minnie! 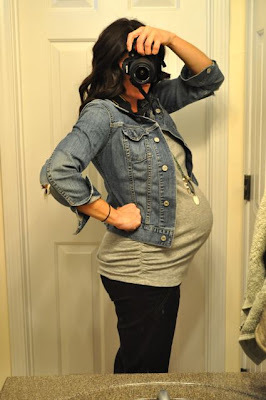 I was huge in my last pregnancy - seriously, you wouldn't recognize me! It's all for this little man though. On one hand - I cannot wait for him to get here. I keep imagining what he's going to look like. Will he be a blondie like his daddy was? Will he get hubby's curly locks? Will he have my lips (or lack there of)? I just can't wait to lay my eyes on him, kiss his chubby cheeks, and curl my finger inside his little hands. On the other hand, I think this will be our last little one. This pregnancy has gone so fast, and I am trying to enjoy every movement, every anticipation, every moment. I love seeing Addie's face every time she gets to feel her baby brother move. Yesterday we were standing in line at Chick Fil A in the mall. Addison put her hands on either side of my belly and kept kissing it over and over again. We were in the middle of the food court, and even though we were surrounded by people, it was the sweetest, most intimate moment. One that I will cherish and remember forever. Something so simple, but it warmed my heart so much. We are so full of love for this little boy, and he hasn't even arrived yet. Only 8 more weeks. Eight long, but very short weeks. Our lives will change again forever. I never in my life could comprehend how much a child can change your heart - filling it with more love than you could ever imagine. Little boy - you are so loved. We can't wait to meet you! Thanks for listening everyone. I love that I can share this experience with all of you. Have a wonderful Monday!! Posted by Jennifer at 7:29 AM 1 I would love to hear from you! 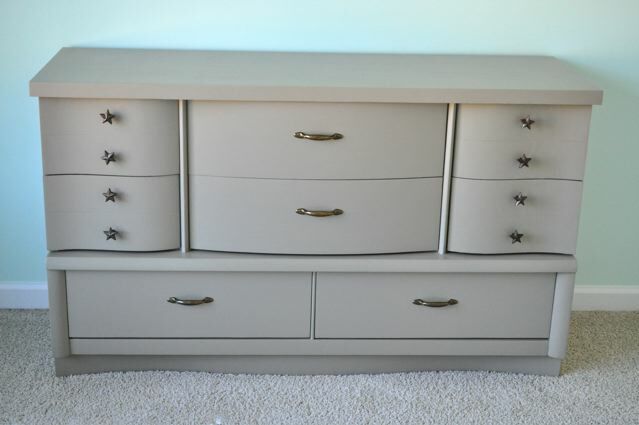 Going into the weekend I have one thing on my mind - refinishing/painting Baby H's dresser! The thing has been sitting in my garage for months, and it's finally time to tackle it! I've got my color all picked out and purchased and I'm ready to go. Of course that didn't stop me from pa-rousing through other people's projects to see if there are any extra finishing touches I might want to put on it. 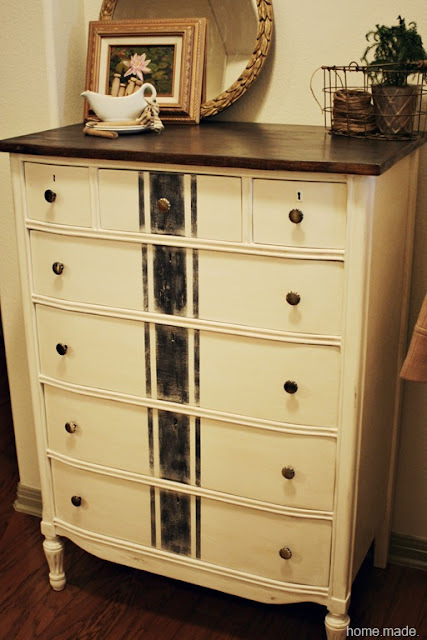 I found some amazing dresser revamps this week - and of course, I am going to share them with you now. 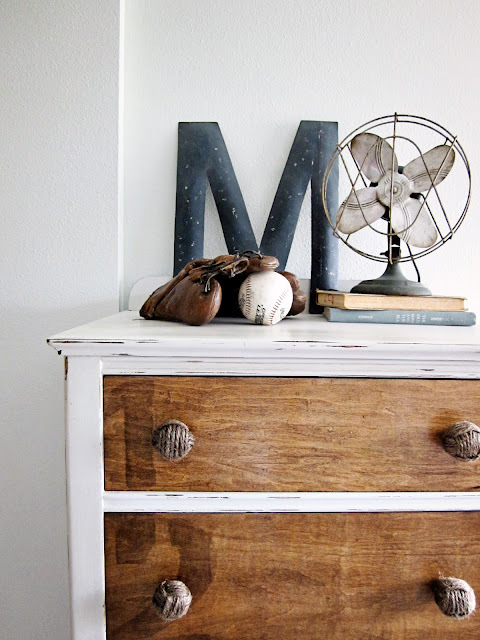 Seriously - I swooned over this dresser that Kristi from KrisKraft refinished for her son Ryan's room. Every single detail of this dresser is perfection - from the stained drawers, to the numbers, to the jute wrapped knobs. The styling is great too - wow! Laura from Ms. Smartie Pants is also working on a nursery for a little girl named Hadley. 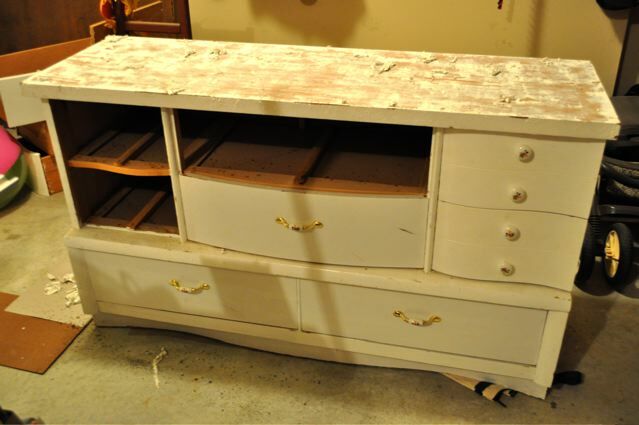 This pink dresser is adorable - LOVE the color and the way it looks in the room. 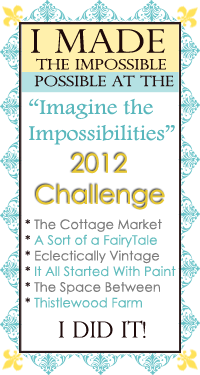 You have to head over and check out the whole space - it's absolutely fantastic! 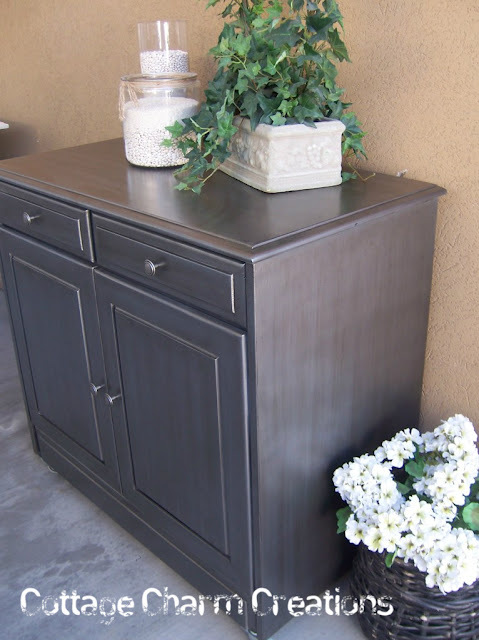 Todd & Jodi from Cottage Charm Creations fell in love with the Zinc finish from Restoration Hardware and decided to tackle it themselves. The finished product is gorgeous, to say that I'm impressed would be an understatement! Isn't she purdy?? Rhonda from Home. Made. was inspired by vintage textiles and refinished a dresser to resemble a french grain sack. Absolutely genius! She picked this up for $50 and made it look like a million bucks. Simple. Classic. 'Nuff said! 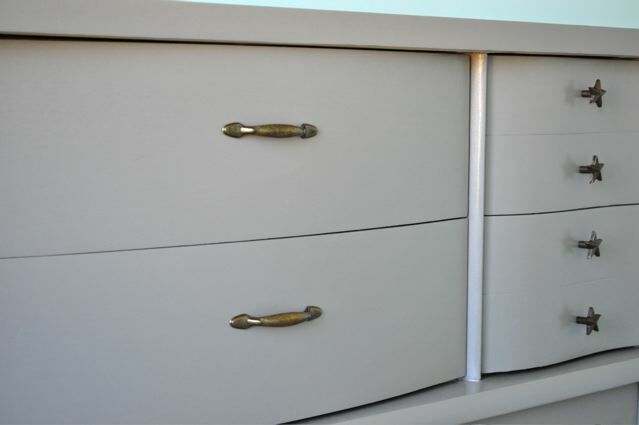 And finally - I love the blue-gray color of these dressers mixed with the white cabinets and drawers. 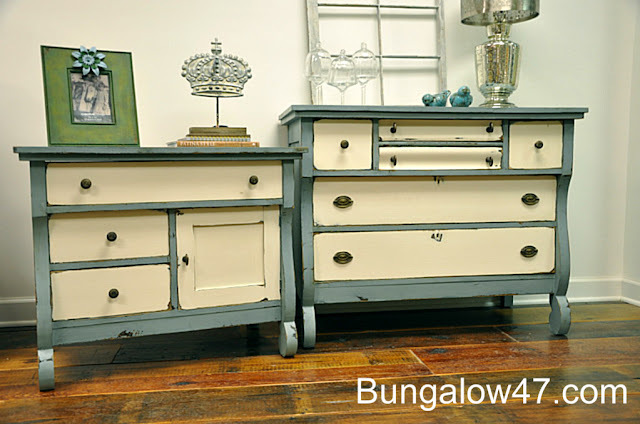 Jill and Chantelle from Bungelow 47 did wonders with the original pieces they started with. You have to head over to see the transformation. The finished product is just beautiful!! I wish I lived in Michigan so I could pay a visit to their shop! That's all for this week. If you were featured, please feel free to grab a button from my sidebar. 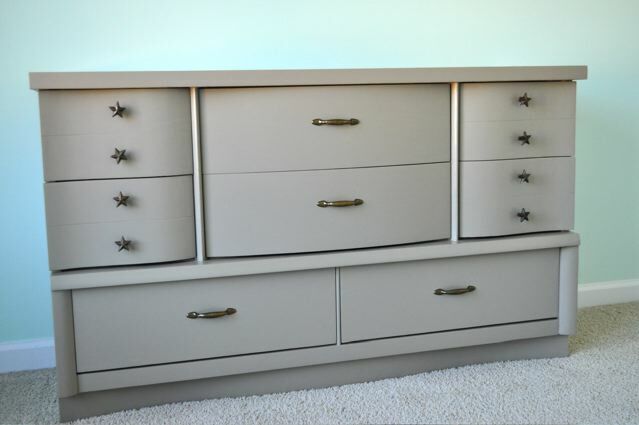 I am so inspired now - CAN'T WAIT to get started on little man's dresser now!! Posted by Jennifer at 7:48 AM 4 I would love to hear from you! Yes, I have fallen off the face of the earth once again - work has been insane this week, and I have been crashing early every night (I couldn't even make it through American Idol last night). Lame, I know! I worked on a few things last weekend that I haven't had a chance to post, so here goes. It's been awhile since I have made some new accessories, and Addison was in need of a few headbands to match the new outfits she got for Christmas. This year, Santa tried hard to stay away from the ever-growing pink wardrobe, so he incorporated some red, blue, purple and green into the mix. 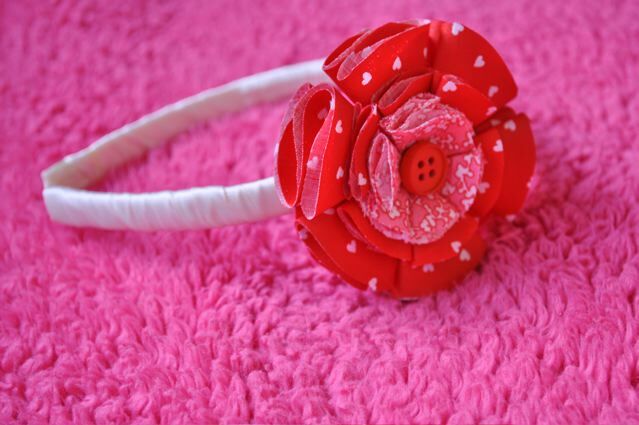 With Valentine's Day rapidly approaching, I decided to make a headband that can serve a dual purpose. I forgot how much fun these are to make! 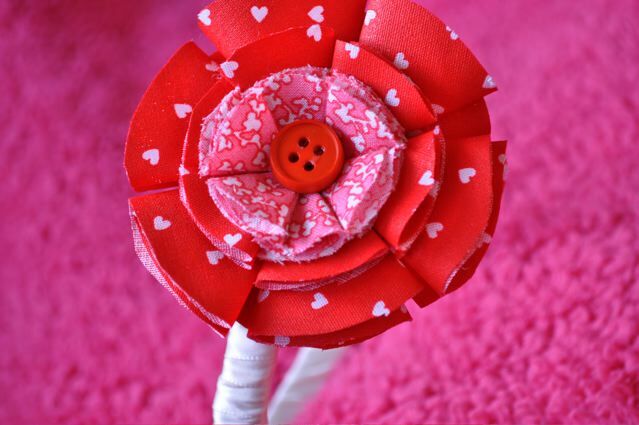 In the end, I asked Addie if she would like the inner petals of the flower to be red, pink or white. She chose...you guessed it - PINK! Oh well, best laid plans, right? I shouldn't have asked! That's it for now - after I post my favorites tomorrow I can share the rest of the projects from last weekend as well as the ones we have planned for this weekend! Posted by Jennifer at 5:34 PM 5 I would love to hear from you! I have been dragging my heels on the Valentine's Day projects, but this week there was so much inspiration out there that I can't help but make some stuff this weekend. Addison had a little Christmas tree in her room this year that she just cannot bear to take down, so I told her we could have a craft weekend and decorate her room (and the tree) for Valentine's Day. 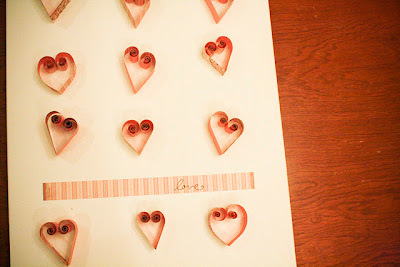 In looking for fun projects to do with her, I came across these amazing Valentine ideas! Nikki at Everything Under the Moon made this super cute yarn wrapped floral wire and pom poms with things she already had in the house. 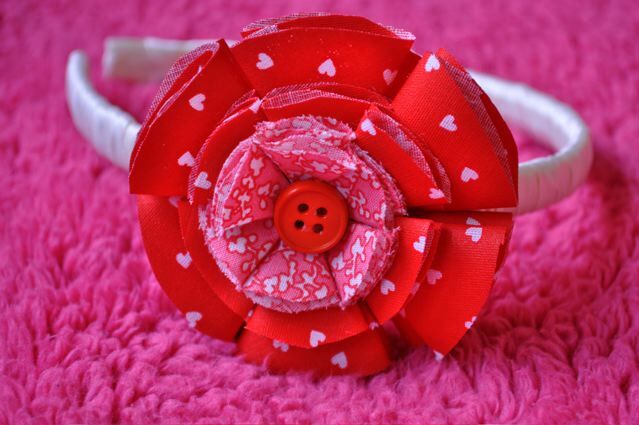 I love resourcefulness - especially when it comes out this cute! Looking for some fun sweets to send to school with your little sweet? 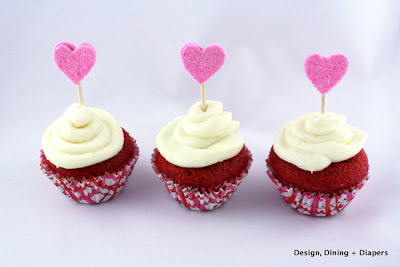 How about these adorable mini gluten-free red velvet cupcakes? Taryn from Design, Dining + Diapers shares the recipe for how to make these little cuties. 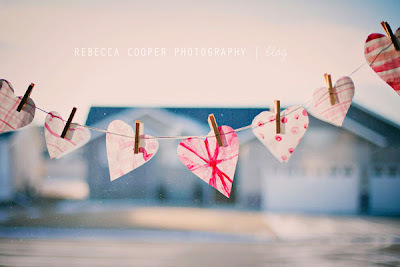 I absolutely fell in love with Rebecca's pretty patterned hearts that she made with her kids. This is definitely an easy project I can make with Addie this weekend - and they look so nice on the window with the light shining through them! 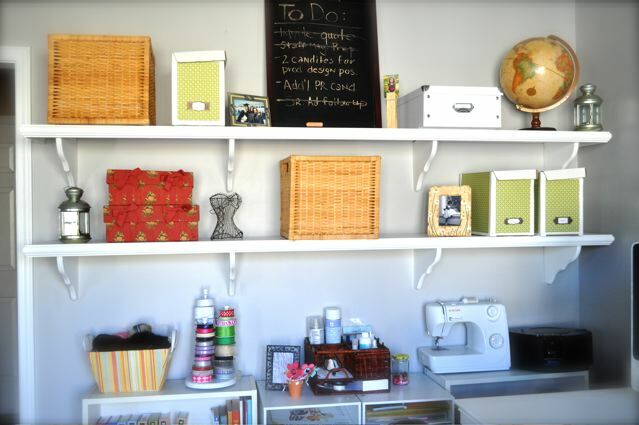 Just as her blog is called - this project is Simple as That! 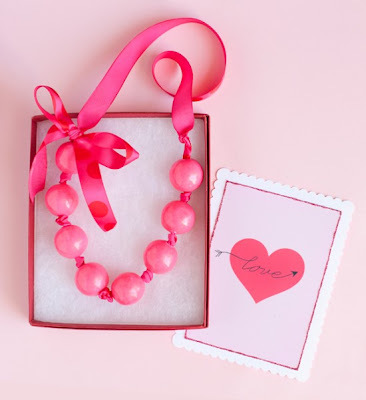 OK - so I WILL be making this gumball necklace as a Valentine gift for Addison this year. I found the tutorial for this little lovely over at One Charming Party. How stinkin' cute, right?!?! 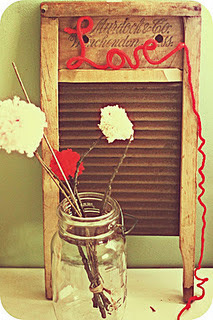 Last, but not least - here's another great Valentine's Day Art project shared by Jamie at The Letter 4. 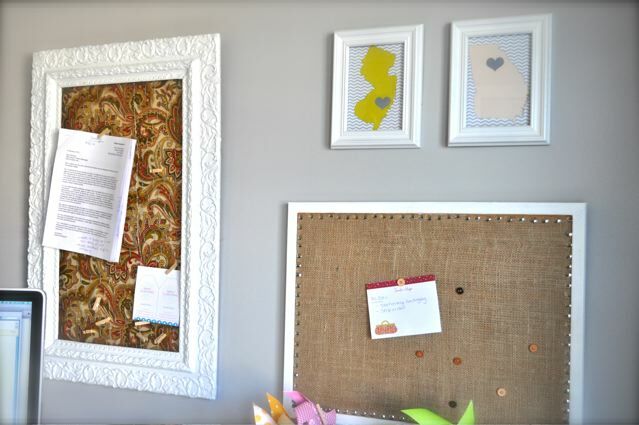 The project is easy and cheap and all she used was paper, Mod Podge and canvas! I heart this (pun intended). 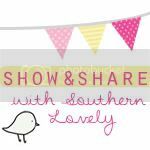 If you were featured - feel free to grab a button from my sidebar. Have a great weekend everyone! 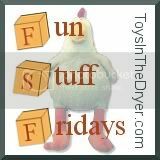 Posted by Jennifer at 8:33 AM 4 I would love to hear from you! Not to beat a dead horse, but I realized that I never posted pictures of the office with artwork/memo boards hung. So, I decided to post them today! This room has been complete for a few weeks, and I must say that working in here every day is such a joy. 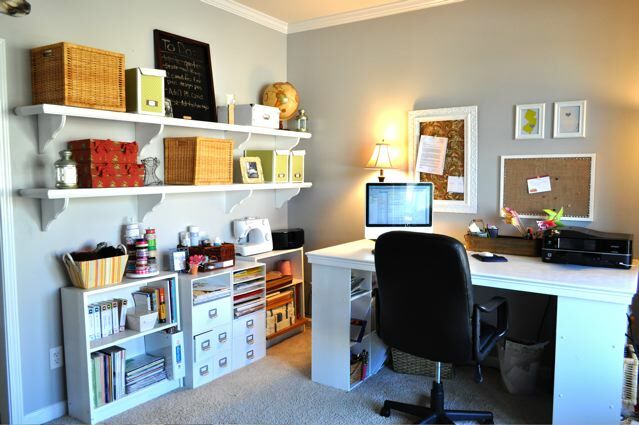 I feel so happy and inspired when I walk in - I think it actually makes me more productive. I want to be in here - whereas before, I would look around and think about what I wanted to do with the room, which made me anxious. So without further ado, here she is. In the last photo you'll notice that I kept around a little friend. 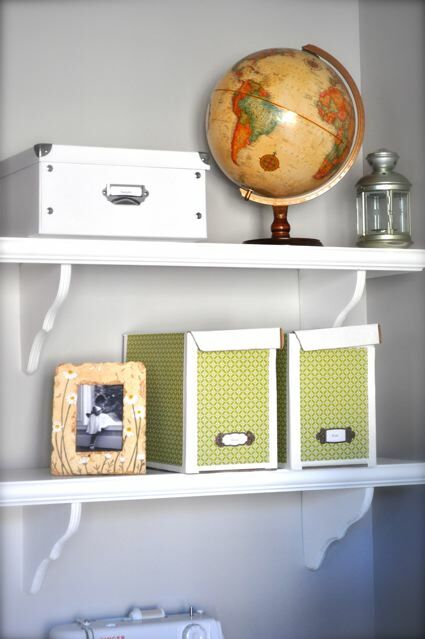 Having this file storage in the space has made a world of difference! 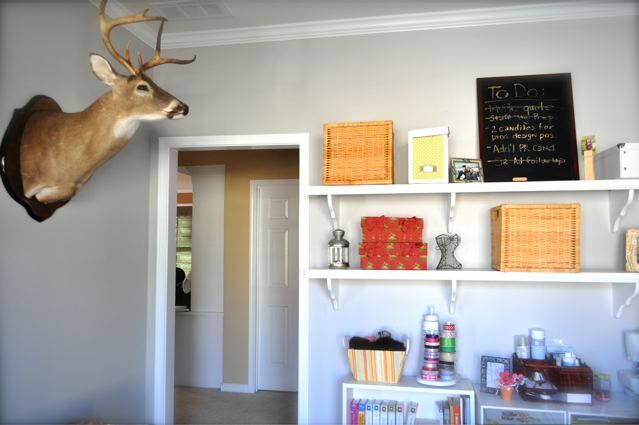 I kind of like the contrast of the girlie girl room and the manly deer. So - he stays for now! That's it! We still need to finish up the window treatments, but for now, it's home. I love it! Posted by Jennifer at 7:13 AM 9 I would love to hear from you! Some of you are getting a jump on your Valentine's projects - I am not one of you yet. 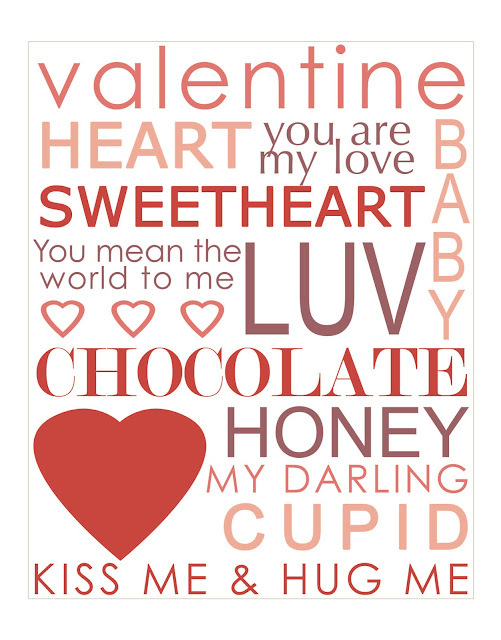 I have other fish to fry (even though I need to start thinking about Addison's school valentines soon)! BUT - last year, I made this Subway Art, and thought that I would share the file with you! I have been getting more and more requests for printables in my Etsy shop - so it seemed like a good time to start offering some to all of you! To print - just click on the file below. It is sized to fit an 8"x10" frame. Enjoy! But please, I need to ask that you use this only for personal use. 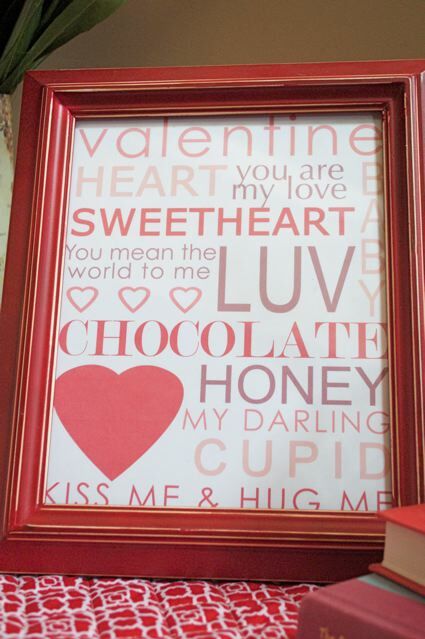 By the way - the red frame used in the picture above was purchased at Hobby Lobby. I just happen to notice last week that they are still selling this frame (and it was on sale)! I hope you get good use out of it! I think this artwork will be making another cameo appearance in my house this year. Before I get going - Carol H. was the lucky winner of the bracelet giveaway from WobiSobi last Friday. Carol - if you are out there - I have been trying to reach you! You have 24 hours to claim your prize, or I will need to choose another winner! Email me!! Posted by Jennifer at 7:37 AM 2 I would love to hear from you!